Review by AllTheBestFights.com: 2016-04-23, some good single shots between Anthony Pettis and Edson Barboza but it is not enough to get three stars: it gets two. The black belt in tae-kwon-do and former Ufc Lw champion Anthony Pettis entered this fight with a record of 18-4-0 (83% finishing rate) and he is ranked as the No.3 lightweight in the world but he comes off two consecutive losses: against #1 Rafael dos Anjos (=Pettis vs dos Anjos) and Eddie Alvarez (=Pettis vs Alvarez). His opponent, Edson Barboza (black belt in tae-kwon-do as well), has an official mma record of 16-4-0 (69% finishing rate) and he entered as the No.16 in the same weight class but he lost two out of his last three bouts, against Michael Johnson (=Barboza vs Johnson) and Tony Ferguson (=Ferguson vs Barboza). Between these two bouts he beat Paul Felder (=Barboza vs Felder). 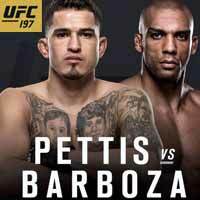 Pettis vs Barboza is on the undercard of Jon Jones vs Ovince St Preux – UFC 197. Watch the video and rate this fight!